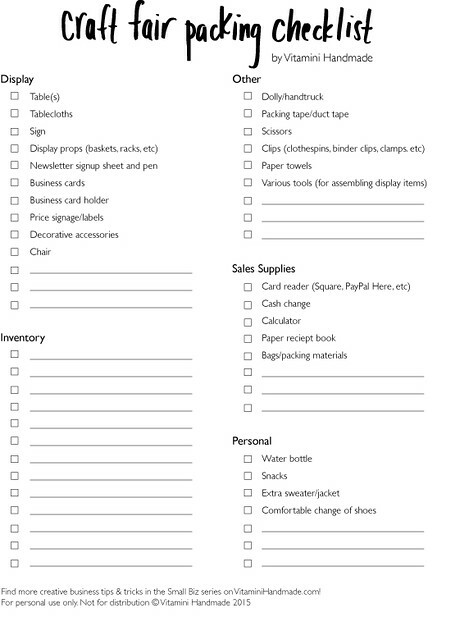 vitamini handmade: Small Biz: Craft Fair Packing Checklist - A Free Printable! 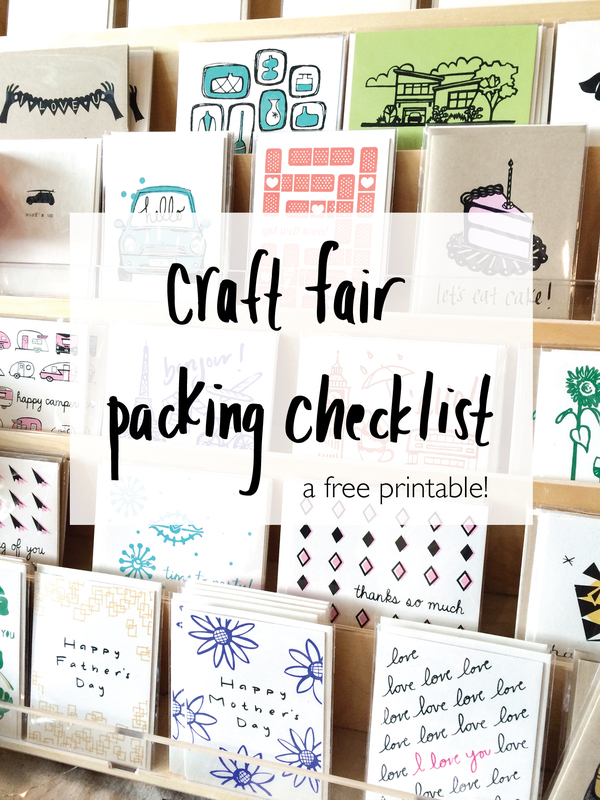 Small Biz: Craft Fair Packing Checklist - A Free Printable! Spring is in full swing and if you're an entrepreneur of the crafty variety you may be considering your craft fair schedule for the year. My mini is still loaded up with inventory that I took to Patchwork Show last Sunday so craft fairs are still fresh on the brain for me. I've done enough of them by now to have a fairly good system in place to make sure I have everything I need, but the panicky feelings still creep in sometimes when I'm on the way to a show - "Did I forget my tablecloths?! Do I have my change?" Feeling totally prepared helps take the stress out of the equation so I decided to write up a craft fair packing checklist. And since some of you may be in the same craft fair schlepping boat I decided to share it here. Click here to download your own copy! Check off each item as you load it in to the car! I included a few blank lines for you to add anything additional or specific that you use in your setup. I hope it's helpful! And I hope you have a wonderful weekend! P.S. Thinking about kicking off a new creative venture but don't know where to start? Feeling like you need to read a few more articles about SEO and product photography before you launch that new Etsy shop? Check out my post about getting started.